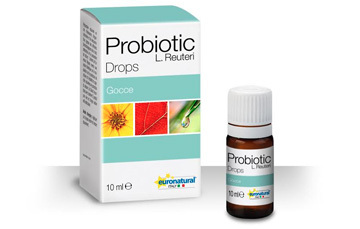 This product is a probiotic supplement containing Lactobacillus reuteri useful to soothe a colicky baby, according to a recent study. Colic occurs during the first three months of an infant’s life in which an otherwise healthy child cries and cannot be comforted for three hours or more every day. Colic affects up to 28% of infants and has no known cause or cure. Recent research suggests colic may linked to an immature immune system struggling with bacterial imbalances in the gastrointestinal tract. It’s an useful solution to give children relaxation, sleep, and well-being. The recommended dose is of 5 drops daily ( 200 ml ).